Last week I planned to make Grilled Potatoes, but unexpectedly we had them the night before when another family member made them for dinner. See what happens when you try to make a family favorite?! I had a huge bag of potatoes and needed something easy to make with them. While I love mashed potatoes, I was looking for something else. Something that went better with a roast beef sandwich. I would have loved to make twice baked potatoes, but I didn't want to send Joe to the store for the rest of the ingredients. I needed to find a recipe that only called for ingredients from our pantry. A quick search online, left me without a plan. While I found many great recipes, I was missing too many ingredients. Next place I checked was my Better Homes and Gardens New Cookbook and I found a great recipe for Oven Roasted Vegetables. I had most of the ingredients on hand and just enough time to get them prepared before the rest of the meal was ready. This recipe was a hit! I need to remember to check that book more often. Grease a 13x9x2-inch baking dish with butter. In a large bowl, combine vegetables. In a measuring cup, mix together the oil, Italian Seasoning, lemon juice, garlic, salt and pepper, then pour over vegetables. Stir to coat. Pour vegetables into the greased baking dish, spreading out evenly. Bake for 45-50 minutes or until potatoes and carrots are tender. Remove foil, stir and allow to cook for 10-15 more minutes or until golden. I didn't figure the calories or measure the portion sizes for this recipe. As soon as it was out of the oven, we loaded it into the car to take to friends' house for dinner. We served 6 adults and still had some leftover. 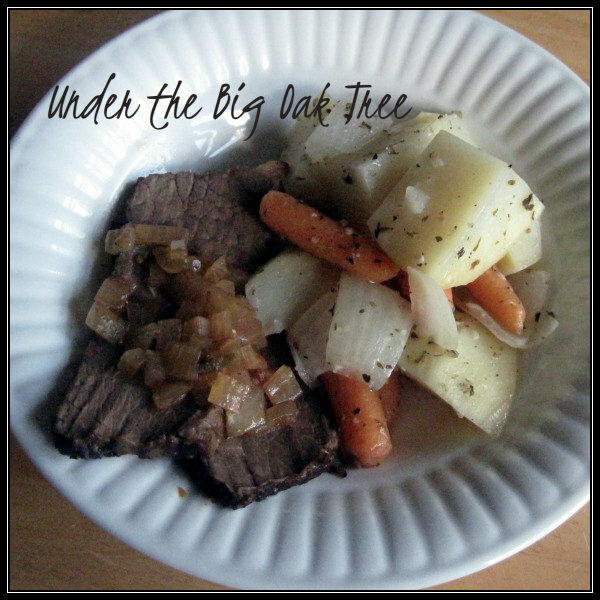 We loved the flavors of this delicious side dish. We'll be making this again!